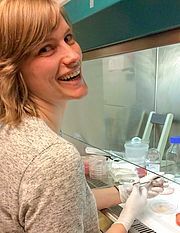 After obtaining a Master’s degree in Drug Development (Pharmaceutical Sciences), I started my PhD at the Ghent Research Group on Nanomedicines. This group, part of the General Lab of Biochemistry and Physical Pharmacy, focuses on the design and evaluation of nanomedicines for advanced delivery of therapeutics in context of retinal diseases, lung diseases, cancer vaccination and intraperitoneal cancer. The first 2 years of my PhD were dedicated to deciphering the intracellular processing of Quantum Dot nanoparticles with an emphasis on the autophagy pathway. Next, my focus switched to examination of drug delivery barriers at the back of the eye. Many ocular disorders leading to blindness could benefit from delivery of therapeutics to the retina. A preferable administration route for delivery to the retina is intravitreal (IVT) injection, a technique that is considered safe, minimally invasive and relatively easy to perform. However, the transfer of drug or gene carriers into the retina after IVT injection remains limited, primarily because of the presence of the vitreoretinal (VR) interface. Figure 1 shows that this interface consists of three structures: peripheral vitreous, the inner limiting membrane (ILM) and Müller cell endfeet. Both the vitreous and ILM represent important drug delivery barriers: the vitreous may hamper the mobility of carriers preventing them to reach the retina , while the ILM forms a physical border between the vitreous and the retina and works as a sieve that impedes the transfer of carriers into the retina. While many viral and non-viral gene carriers are able of successfully penetrating through the entire VR interface in rodents, IVT injection in larger animals rarely results in effective gene expression. This is due to the fact that the anatomy of the rodent eye and the structure of its vitreous and ILM is less representative for large animal or human physiology. There is therefore a great need for models that can realistically mimic these barriers. To address this need, my PhD project focused on the development of a ‘vitreoretinal explant’, an ex vivo explant model that is bovine-derived and guarantees an intact VR interface by keeping the vitreous attached to the retina at all times (Figure 2A). After explant culture, drugs or drug carriers can be IVT injected ex vivo into the vitreous of the VR explant after which their potential to cross the VR interface as well as their transport route into the retina can be examined by microscopy (Figure 2B). Figure 1. Schematic drawing of the vitreoretinal interface and vitreous. ILM: inner limiting membrane, VR: vitreoretinal, M: Müller cell, G: ganglion cell. Figure 2. A) picture of a vitreoretinal explant. B)Retinal section of a vitreoretinal explant 24 hours after injection of polystyrene beads. 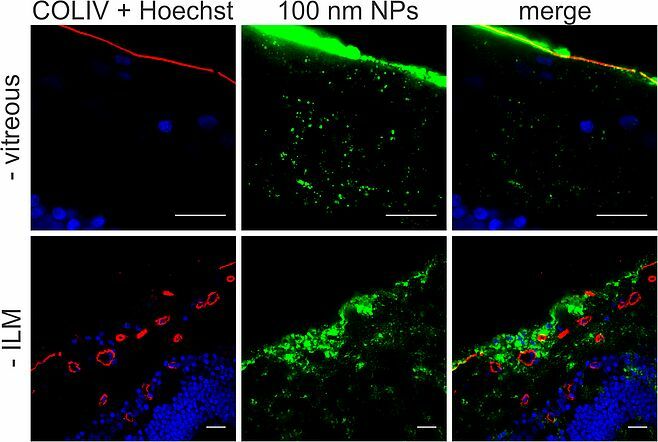 Green: 100 nm polystyrene beads injected in the vitreous; Red: ILM stained for collagen, which also stains retinal blood vessels (*); Blue: Hoechst staining of nuclei. Scale bar 50 µm. After validation of the vitreoretinal explant (viability and ILM integrity), we applied the model to look into the penetration of nanoparticles in function of their physicochemistry. Here, we discovered that the transfer through the VR barrier is size-dependent since 40 nm negatively charged polystyrene beads were more easily taken up in the retina than 100 and 200 nm sized particles (Figure 3). Figure 3. Representative cryosection images showing the transport of polystyrene beads through the vitreoretinal interface, 24 h after injecting the PS beads in the vitreous of the VR explant. ILM and blood vessels are stained with anti-collagen antibodies (red), nuclei (blue) with Hoechst, particles are shown in green. Note that the contrast in the middle panel is enhanced to optimally visualize the PS beads, while the brightness of the PS beads is reduced in the right panel to illustrate the perfect alignment of the vitreous and ILM. The scale square in the top left image represents 1000 µm2 (31,6 µm x 31,6 µm). Scale bar: 31,6 µm. In addition, we found that removing the vitreous, as commonly done for culture of conventional explants, leads to an overestimation of particle uptake since more nanoparticles could enter the retina including larger aggregates (Figure 4, - vitreous). 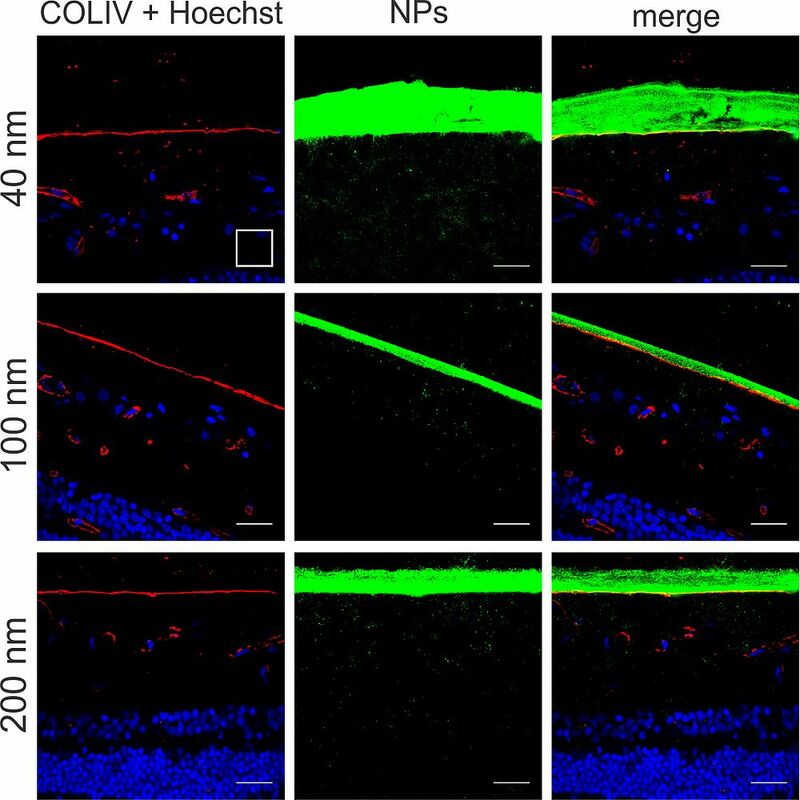 We further confirmed that the ultimate barrier to overcome for retinal uptake is the ILM, since damaging this matrix resulted in a massive increase in particle transfer into the retina (Figure 4 – ILM). Figure 4. Representative cryosection images showing the transport of 100 nm sized PS beads into the retina, 24 h after applying the beads on the explants. Top row: no vitreous, bottom row: no ILM. ILM and blood vessels (red) are stained by anti-COLIV antibodies, nuclei (blue) with Hoechst, particles are shown in green. Scale bar: 20 µm. In conclusion, we have successfully developed a highly relevant ex vivo model which by keeping the VR interface more intact than conventional explants, can be applied as a representative test set-up to assess the potential of promising drug and gene delivery carriers to cross the VR interface. By doing so, we have provided researchers with a large animal model that can provide valuable information without costly and labor-intensive in vivo studies. We hope that this advanced ex vivo model can aid in the rational design of optimal retinal drug carriers by tuning the carrier features in line with the barriers’ properties. Our lab therefore gladly welcomes visitors willing to learn this and/or other advanced drug delivery models we have developed. With the end of my PhD in sight, my postdoctoral project will focus on advanced approaches to overcome the ILM and the formulation and evaluation of novel nanoparticle formulations. K. Peynshaert, J. Devoldere, S.C. De Smedt, K. Remaut, In vitro and ex vivo models to study drug delivery barriers in the posterior segment of the eye, Adv. Drug Deliv. Rev. (2017). doi:10.1016/j.addr.2017.09.007. K. Peynshaert, J. Devoldere, V. Fradot, S. Picaud, S.C. De Smedt, K. Remaut, Toward smart design of retinal drug carriers: a novel bovine retinal explant model to study the barrier role of the vitreoretinal interface, Drug Deliv. 24 (2017) 1384–1394. doi:10.1080/10717544.2017.1375578. M.M. Le Goff, P.N. Bishop, Adult vitreous structure and postnatal changes., Eye (Lond). 22 (2008) 1214–22. doi:10.1038/eye.2008.21. T.F. Martens, D. Vercauteren, K. Forier, H. Deschout, K. Remaut, R. Paesen, M. Ameloot, J.F. Engbersen, J. Demeester, S.C. De Smedt, K. Braeckmans, Measuring the intravitreal mobility of nanomedicines with single-particle tracking microscopy, Nanomedicine (Lond). 8 (2013) 1955–1968. doi:10.2217/nnm.12.202.